The Big Picture has 13 great photos of the declining level of the Dead Sea. Why visit the Bible Lands Museum Jerusalem? Bible History Daily points out 10 great biblical artifacts. That same museum is hosting a new exhibit “By the Rivers of Babylon” that is profiled in Haaretz. The Tower of David Museum in Jerusalem is using iPads and phones to improve the visitor’s experience (NYTimes). The Melbourne Museum has produced a recreation of the eruption of Mount Vesuvius that destroyed Pompeii. Illegal excavations in Alexandria have revealed a Graeco-Roman necropolis. They now think they know who was buried in the Amphipolis tomb. This article has more details and illustrations. 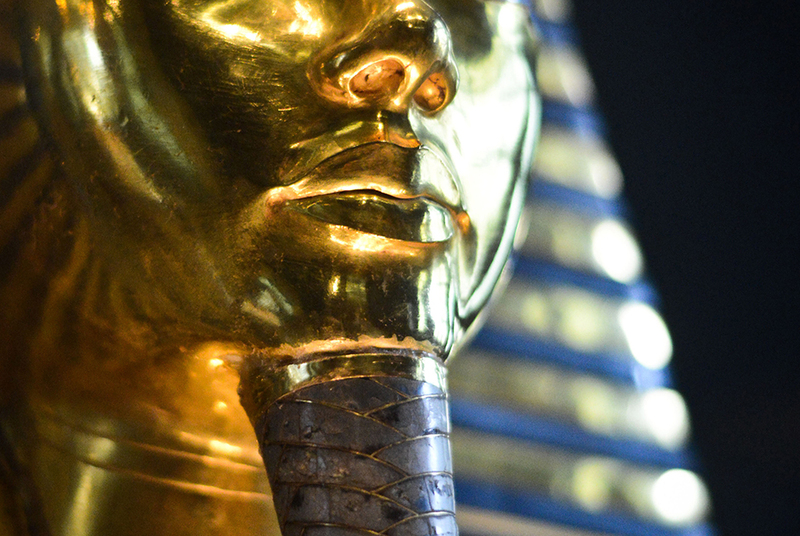 King Tut’s beard was knocked off and then re-attached with epoxy glue. Here’s a close-up of the botched repair. Leen Ritmeyer suggests a location for the stairs of the Antonia Fortress where Paul went up and down. Medical imaging technology has been put to use in reading burned papyri from Herculaneum. Approval has been given to re-open the old Acropolis Museum. You can subscribe to the weekly podcast of The Book and the Spade at christianaudio.com. This week Clyde Billington gives an update on Temple Mount archaeology. Last week I addressed the problem of sensational stories in biblical archaeology. The latest issue of Ancient Near East Today is now available. Ferrell Jenkins shares photos of Aphek/Antipatris and the “other Aphek.” I particularly like his aerial photo of the northern site. Miriam Feinberg Vamosh describes the history of Jezreel and its recent excavations in an illustrated pdf article at The Bible and Interpretation. Iraq is seeking to have the ruins of Babylon put on the UNESCO World Heritage List. ICYMI: Accordance photo collections are on sale through Monday. This year marks the 150th anniversary of the Palestine Exploration Fund. This post shares interesting items from the 100th anniversary exhibition. A calendar of coming lectures is also available. After a flub over a mummy graveyard, a BYU researcher restores ties with the Egyptian authorities. An upcoming CBS miniseries follows four female survivors of Masada. Trailer here. Aren Maeir announces the 2015 Ackerman Family Annual Workshop in Biblical Archaeology. The topic is Southern Canaan in the Late Bronze Age. Excavators working at Macherus have restored the site according to the principle of anastylosis, using only original architectural elements. Matti Friedman: The Sistine Chapel of the Jews Is Restored to Life in Jerusalem. Jack Sasson, curator of the Agade list which provides us with many stories each week, has retired from Vanderbilt. Mari Had a Little Lamb is one of several Assyrian coloring pages. We are now on twitter @BiblePlaces. Archaeologists working at Bethsaida have discovered a possible escape tunnel from the time of the Israelite monarchy. Leen Ritmeyer explains the recent construction work on the Temple Mount and its potential significance for archaeology. Egypt’s Prime Minister recently visited the Grand Egyptian Museum to check on its progress for a slated August 2015 opening. The works of the famous glass maker Ennion are now on display at the Met. The Museum of Biblical Art in Dallas is hosting a temporary exhibition of old maps of the Holy Land. Wayne Stiles shows a few photos from his visit and explains the value of using maps in your Bible study. Monday lecture at the British Museum: Rupert Chapman, Ahab’s Ivory House: When Was It Destroyed? Plans are underway to allow visitors inside the Erechtheion of the Acropolis. The most visited museum in 2014 was the Louvre, with 9.3 million visitors. This spectacular Ashkenazi Torah from Germany dates between the late 15th and early 16th century A.D. (roughly around the time of Martin Luther). The scroll’s pagination and orthography clearly indicate this date, while its style, the preparation of its skins and its ink all clearly indicate a German provenance. Such a date makes it among the earliest 2% of surviving German Torah scrolls. It has been used continuously for nearly 500 years and survived the Nazi Holocaust, the most horrific chapter in Jewish history. It is approximately 100 feet long and is written in columns of 59 lines throughout. It contains numerous fascinating orthographic features encountered in medieval scrolls that were repressed by the rabbis around 1600 A.D. The Torah is filled with elegant magna letters, small or raised letters, dotted letters and inverted nuns—all related to early Jewish scribal traditions. The official announcement of the dedication contains a few more details about the scroll, and a report written afterwards includes even more description as well as photos of the event. The scroll is valued at over $400,000. The scroll has indented punch marks (tropes) above words and letters to aid in pronunciation and cantillation. This feature is more typical of Yemeni Jewish scrolls. The scroll was constructed from over 60 calf skins. It contains corrections, crossed-out words, and later repairs to the parchment. 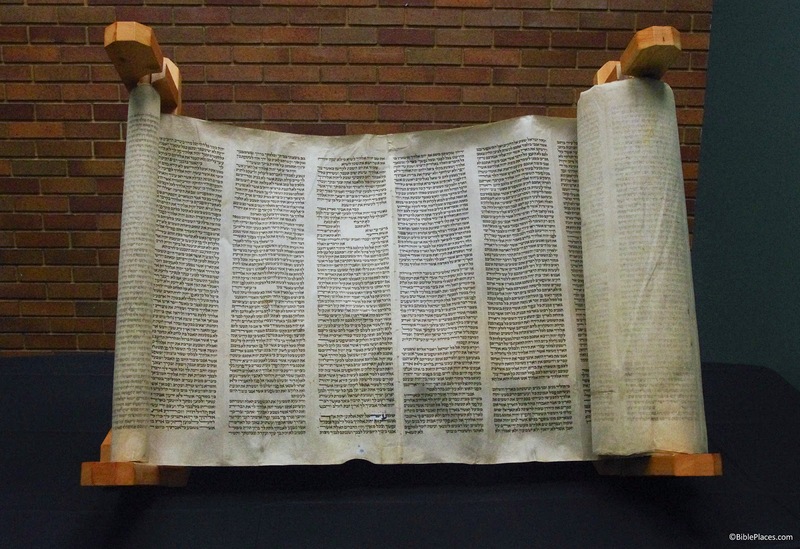 The scroll was copied and used in Germany, survived the Nazi Holocaust, and was later transported to Israel. There are plans to create a digital replica of the scroll. Here are two photos of the Trinity Ashkenazi Torah Scroll. The scroll is open to Deuteronomy 5. The lines that are spaced differently near the top of the center column are the 10 Commandments. 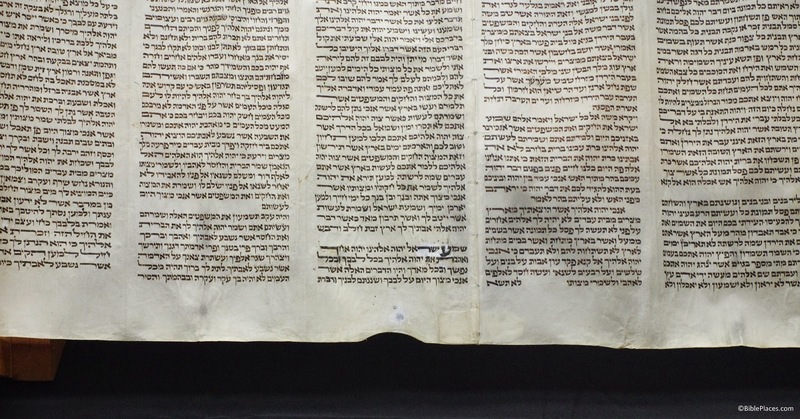 Close-up of Deuteronomy 6:4 in the Trinity Ashkenazi Torah Scroll. Notice the extra large letters which mark the first and last words of the verse. The white patch is newer parchment used to repair the original. Bethel University received a similar gift earlier in the year (here, here, and here). UPDATE (December 20, 2015): As of early December 2015, Ken and Barbara Larson have donated Torah scrolls to 16 schools. The list below is as complete as I could make it, but it is missing two schools. @BiblePlaces provides news updates and daily photos. If you’re on Twitter, follow us @BiblePlaces! Wayne Stiles explains how Kadesh Barnea helps us to know God’s will. Jerusalem’s recent snowfall: SourceFlix shares some beautiful aerial footage. Swedish archaeologists have found near Cairo a 2,500-year-old relief depicting two pharaonic deities. And Czech archaeologists find tomb of previously unknown pharaonic queen Khentakawess. The original volumes of the Tell en-Nasbeh (biblical Mizpah) excavation reports are now available online for the first time. The Bade Museum website includes a couple of other downloads that may be of interest. And now published by Gorgias Press: "As for me, I will dwell at Mizpah …": The Tell en-Nasbeh Excavations after 85 Years, edited by Jeffrey R. Zorn & Aaron J. Brody. The Yale Babylonian Collection now has its own website. The open access, electronic companion to Royal Inscriptions of the Neo-Assyrian Period, volume 3/2 (Eisenbrauns, 2014) is now online. “Patterns of Evidence: Exodus,” claims to solve the problem of lack of evidence, but it appears to do so by a major chronological revision. As far as I’m concerned, a movie showing on only one night (Jan 19, 7pm) in selected theaters doesn’t deserve much attention. A full-scale sailing replica of the Ma‘agan Michael is now under construction. The original ship wrecked near Dor in 400 BC and was discovered in 1985. Both portions of P46 have now been digitized and are available online. Kevin Shillington has begun a series on Charles Warren on the Palestine Exploration Fund Blog. Coming soon: Discovery House Bible Atlas, by John Beck. The official website of the "Roads of Arabia" exhibition is online here. I did not notice before that the site has a downloadable "Roads of Arabia Bibliography" at the bottom of this page (direct link). This looks like a helpful resource to have on hand. The first two items of the bibliography are exhibition catalogs. The first of these can be downloaded at the link given above. The second one looks very similar to the first catalog, but it is not exactly the same. Poking around online, I was able to locate a few of the individual chapters. These appear to have better quality images than the full-volume pdf. “Introduction: Roads of Arabia – Archaeological Treasures of Saudi Arabia”by Ali Al-Ghabban and Stefan Weber. “Natural Environment of the Arabian Peninsula” by Max Engel, Helmut Brückner, Karoline Meßenzehl. “Old Arabia in Historic Sources” by Daniel Thomas Potts. “Ancient Tayma’: an Oasis at the Interface Between Cultures New Research at a Key Location on the Caravan Road” by Arnulf Hausleiter [in German]. “Dedan: Treasures of a Spectacular Culture” by Said Al-Said. “Writing Systems and Languages of Arabia – A Tour” by Michael Marx. The Nelson-Atkins Museum of Art also has a downloadable bibliography related to the exhibition. The Lanier Theological Library is inviting scholars and patrons to a free seminar on Historical and Archaeological Evidence for the Jewish Diaspora after 722 BC. The seminar will be held on Friday, January 16, from 2:00 - 5:00 p.m., in our chapel, located at 14130 Hargrave Road, Houston, TX 77070. This seminar precedes and ties in well with the library's lecture on the next day by Rabbi Benjamin Scolnic, "The Book of Daniel and the Nature of Biblical Truth." Registration for the Saturday evening lecture is separate from this seminar. This 3-hour session on Friday will feature the six presenters and presentations below. K. Lawson Younger (Trinity Evangelical Divinity School) "Israelites and Judahites in Assyria and Babylon in Cuneiform Sources"
James K. Hoffmeier (Trinity Evangelical Divinity School) "Judeans in Egypt after the Fall of Jerusalem in 586 B.C." Richard Hawes (Archaeology Forum, Tyndale House Cambridge) "Did Edom Annex Parts of Southern Judah Following the Fall of Jerusalem in 567/8 B.C." Benjamin Scolnic (Southern Connecticut State University) "The Book of Daniel and Modern Theories about the Persecution that led to the Story of Hanukkah"
Gary A. Rendsburg (Rutgers University) "Septuagint, Synagogue, and Symbiosis: The Jews of Hellenistic Egypt"
Thomas W. Davis (Southwestern Baptist Theological Seminary) "Jews in Cyprus in Hellenistic Times"
We invite you to attend this seminar as an opportunity to expand your knowledge, contribute to the discussion, connect with other attendees and explore this library. You are welcome to extend this invitation to pastors, graduate students, or other people you think would be interested. Seating is limited, so please register for this event by JANUARY 14, 2015. To register for this free seminar, go here. Registration for the Jan. 17 lecture at 7 p.m. is still open here. The Israel Exploration Journal is published twice annually. Several of the articles from the latest issue (64/2) may be of interest to readers here. Access to the full articles requires a subscription (print or electronic, via JStor). Abstract: A tiny fragment of a cuneiform tablet was recovered in the Ophel excavations in Jerusalem in 2013. Even smaller than the fragment recovered in the 2009–2010 excavations (published in IEJ 60 in 2010), the fragment preserves only parts of five signs. Nevertheless, on the basis of the provenance study and an analysis of the physical tablet and sign forms, we are able to suggest a Ramesside date for the tablet and propose that this fragment, like the earlier tablet, comes from a royal letter. Abstract: Surveying in the southern Levant has until recently been limited to basic methods of surface artefact collection. While recent regional studies have begun to integrate other methods, surveys conducted on individual sites—particularly multiperiod settlements (tels)—remain outdated. The following study presents the results of two different survey methods applied at the site of Tel Burna, Israel—surface artefact collection and test-pit surveying—and conducts a three-way comparison between the two survey methods and the excavation results, in an effort to promote survey methodology in the region and to determine the best way for surveying such sites. This will help to reduce the expense and damage caused by excavation, while providing further information on the sites, not obtainable through excavation. Abstract: The article discusses two Boundary of Gezer inscriptions found in 2012. One inscription, classified as no. 4, had previously been discovered by Clermont-Ganneau but was never fully published, and had not been seen in the field since his time. The other is a newly discovered thirteenth Gezer boundary inscription; the tenth one with both גזר תחמ and ΑΛΚΙΟΥ. In an appendix, the authors also attempt to sort out the disjointed nature of the discovery, publication and attribution of the Boundary of Gezer inscriptions over time. The full table of contents with abstracts is available on the website of the Israel Exploration Society. For previous issues, see here. You might, especially if those ruins were particularly large and difficult to move. There may also have been some Roman motivation to leave the ruin as a monument to what happens to those who rebel against Rome. Furthermore, Gibson argues that the Temple Mount architecture was imitated by later religious structures. Typically the structures of Mamre and the Machpelah in Hebron are dated to the time of Herod, not later, thus accounting for the similarity in design. Ronny Reich excavated the material that Gibson is now questioning. Not surprisingly, he does not agree. Read the full article by Nir Hasson here. I’d like to see more of the discussion between these archaeologists, but at this point, I don’t think the textbooks need to be rewritten. The Bible Lands Museum Jerusalem is hosting a special exhibition entitled By the Rivers of Babylon beginning next month. An international conference on Jerusalem in Babylonia will be held on February 2-3. Now online: the Fall 2014 issue of DigSight, published by Southern Adventist University's Institute of Archaeology. See the Holy Land has published new articles on Kathisma and the Church of St Alexander Nevsky (the Russian excavations), and an updated article on Magdala. Free video lecture online: Doctors, Diseases and Deities: Epidemic Crises and Medicine in Ancient Rome, by Sarah Yeomans of the Biblical Archaeology Society. Matthew Karsten hiked portions of the Israel National Trail and has some spectacular photos to show for it. Aren Maeir will be giving a lecture on the latest work at Gath at the Albright Institute on January 15. Registration for MEMRA’s ancient language courses ends soon. G. M. Grena shares some personal thoughts and more from his time at the ASOR 2014 conference. The British Museum explains why it was so pleased to be involved in the latest Night at the Museum movie. The new Exodus movie is “an unimaginative, mind-numbing bore,” according to Michael Heiser. Egypt has banned the movie “Exodus: Gods and Kings” for being historically inaccurate. ISIS is threatening to blow up the walls of ancient Nineveh. Vassilios Tzaferis has died in Athens. Among Tzaferis’s excavations was the tomb of the crucified man. The new excavations at the Citadel of David are described by Seth J. Frantzman in an article at the Jerusalem Post. The excerpt below begins with a quotation from Amit Re’em, the Jerusalem District Archaeologist. “He spoke of a lot of water; baths, ritual baths, pools. Herod loved water and this is proof,” says the archeologist pointing to the drainage system that goes under the Old City walls and ends at Sultan’s Pool. Re’em, energetic and constantly on the move during the tour, is fluent in all the historical geography, shifting from the story of the High Priest Annas to the tale of how Jesus was brought to the palace of Herod, according to the New Testament. Eilat Lieber, the general director and chief curator of the museum, has a vision for the Kishle that involves opening it to the public for tours as well as making it a center of culture. The full story gives more of the modern history and plans for the museum’s future.